Initial technologies for single incision laparoscopy have primarily been access devices with multiple instrument ports crowded together for “inline” operation without the triangulation usually achieved via multiple trocars at the abdominal wall. The initial version of the SPIDER® surgical system (TranEnterix, Durham, NC) approved in 2008 represented a promising new development with intra-abdominal triangulation with flexible, steerable instrument channels. However, the goal of providing flexibility with significant force strength remains elusive. 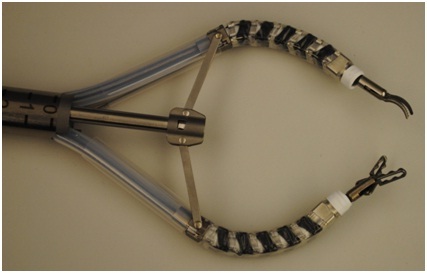 The newly designed technology of the SPIDER Vertebral Endomechanical device was designed with the objective of providing significant force strength while maintaining the unique capabilities of flexible instrumentation. The fundamental technologies employed are two, endomechanical arms controlled via wires, and a novel, vertebral channel to steer flexible instrumentation. The vertebral channels consist of 12 alternating segments which result in a “rolling joint” rather than a fixed single joint often used in alternative instruments that articulate. The joints are controlled by 4 integrated wires which translate movement and force generated by the operator to the distal working tips of the instrument. The new vertebral technology was evaluated in a porcine model via a cholecystectomy and a nephrectomy. Both procedures were successfully completed in the porcine model, and several device capabilities were observed in terms of strength (lifting of porcine kidney and significant traction force on tissue). Current accepted technique of conventional 4-port laparoscopic cholecystectomy requires simultaneous cephalad traction of the fundus and lateral traction of the infundibulum of the gallbladder, in order to satisfactorily expose the critical structures. The device was able to perform these functions as well as allow for the “peeling” motion needed to expose the cystic duct and artery. Similarly, dissection of the kidney during laparoscopic nephrectomy requires strength and precision while dissecting the major structures (ureter and vessels). The vertebral endomechanical arms permitted both the elevation and “rolling” motion necessary to achieve this. The design of the device allows flexibility while maintaining strength and precision. The novel design of vertebral segments appeared to provide strength in utilizing flexible, catheter-like, instruments in manipulating tissue to perform surgical tasks in a porcine model. The capabilities to blunt dissect, provide significant traction for tissue dissection, and lift large specimens were all observed in lab usage. The concept of providing truly flexible yet strong instrumentation in laparoscopy is a meaningful advance with potential to merge the tools and unlimited angles of flexible endoscopy with the technique and surgical work needs of laparoscopy. Certainly, further study is needed to evaluate the intriguing potential presented by this novel flexible laparoscopic system.